Everybody complains about the mainstream. If you're reading this article, in all liklihood you have, at some point, been involved in a conversation about how there used to be good music, but now nobody talented ever gets popular. But how many people actually go out and support worthy bands at the local level? Especially in the goth/industrial community, where it's often easier to get people out to a DJ night than it is to get them to see the band actually perform the songs you might hear at the club. And, let's be honest, part of it has to do with some of those bands putting on shows that are about as interesting as watching someone spin records. But the Haitian Hate Gods are out to show you that electronic-based acts can rock the stage as well. "We try to put on a show," said Hate Gods guitarist Chad. "People pay money to see a show, and I feel like it should do something other than just be like listening to a cd." 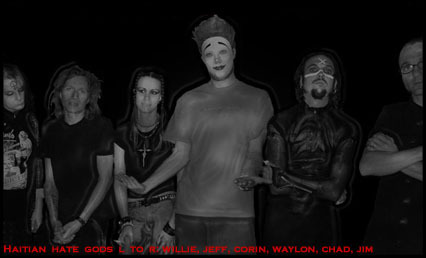 Haitian Hate Gods began after the dissolution of Invisible Records band VooDou, with Chad and fellow guitarist Jeff, along with drummer Waylon deciding to form a new project. "We can't sit idle, so I had to start another band or go to an insane asylum. Of course, I picked the members that wanted to be a part of it, and then we just tried to find some more that had the same idea we did and could make it happen." Added to the mix were vocalist Corin, Jim on bass guitar, and Willie as a third guitarist. "I was drafted into the band," said Willie. "I was with VooDou on a tour helping out, and Chad insisted that I join." 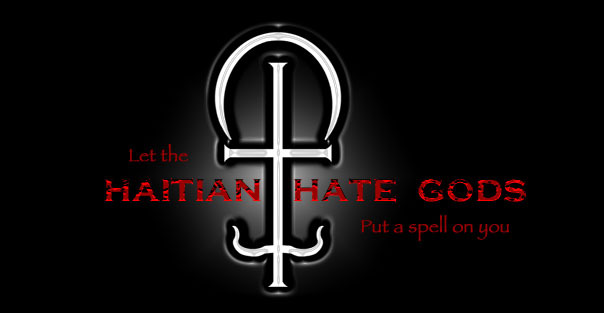 While Haitian Hate Gods provides a new beginning, it is not without similarities to the former band. "The members that were in VooDou before, they play a certain way, and we play a certain style of music -- it isn't like we switched to country or something," said Chad. "We're still in the same vein, so it's kinda hard for it not to go back to that." They describe themselves as electronic rock, but generally get placed in the goth/industrial category, a tag Chad doesn't mind. "I definitely will not reject the title, it's just I know a lot of goth kids look at the Cruxshadows as being goth -- not us. And "industrial" to them is some band with a German name that I can't even pronounce, that has pigs on sticks and such." So, if the presence of decapitated animals on stakes is a requirement for you to enjoy a show, this might not be the band for you. But they do possess a multifaceted sound, with members citing influences from Nine Inch Nails and Ministry to Jane's Addiction and Love and Rockets. Even jazz and funk artists have played a role in building the Hate Gods sound. Their eclecticism shows in their work with tracks like "104" displaying driving electronic metal, while others like "Violet" have a gothic, yet soulful quality. "It all comes together in the end, and you probably can hear it in the variety of songs that we have going on," said Willie. Live, they tend to show their influences not only through their original material, but with the covers they perform, which include My Life with the Thrill Kill Kult's "Days of Swine and Roses" and Concrete Blonde's "Bloodletting." 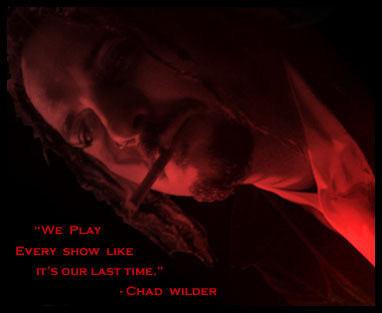 Said Chad, "We usually try to pick songs that have meaning to us, and we try to do it justice. You won't hear a punk rock version of Johnny Cash's "Man In Black." We try to keep the feel of the song and yet add our element to it." As of late, The Hate Gods have also been performing some of their former band's material as well. "Recently we've added a VooDou set to the mix," said Chad. Some people would like to see them go back to being VooDou altogether, including their former label's head, Martin Atkins. "He wants us to go back to being VooDou and continue to work with him. I think, really what it is -- he's got so many bands that he's signed, he doesn't want to add yet another band to his roster. It's such a financial strain on any label to get a band off the ground," said Chad. "To be affiliated with a label that we were affiliated with before, and not be the same name, kinda negates anything he did before." Although, at this point they have not completely made a decision on this matter, there do seem to be some incentives to reclaiming the old name, as Atkins has expressed interest in having them open some shows for the upcoming Pigface tour. "We'd have to be called VooDou to do that," said Chad. "I think he's wanting to resurrect VooDou for the tour." Whatever happens with their name, the Hate Gods feel the most important aspect to their success is getting people out to support the shows. "It takes a lot to drag people out of their houses to come see a show. Back in the day, if anybody came remotely near where I lived, if it was industrial or goth, I would make the trek out to try to support the scene," said Willie. "But that's not really how it goes these days, unfortunately." Chad sees some of the same problems relating to fan support of music in general. "The scene today isn't like it was in the '80s. 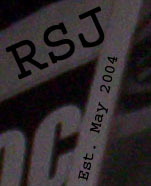 A lot of people were band loyal back then," said the guitarist. "I'm a good example of that, cause I continue to buy Cult albums even though they don't sound anything like they used to. So, I think getting a following of people that will stand behind you through thick and thin is probably the biggest obstacle that I can think of." Haitian Hate Gods have several upcoming dates in North Carolina, including February 11 at the Tremont Music Hall. They are planning a southern tour for March as well. While they have a limited edition album for sale at shows, as well as some tracks re-recorded, with Hate Dept's Steven Seibold producing, available on their website, what is most important to the band is staying on the road. "I'd just like to be a constantly touring band," said Willie. "We give it 110%," adds Chad. "We play like it's our last show every time. And hopefully it won't be, but I just want people to not regret coming out to see it. I don't want to see gothic or industrial styles of music die. I don't care if it gets mainstream or not, but it should always continue to exist, and the only way to make that happen is for people to try to support it as best they can."